This tutorial explains prestaging a computer object in the Windows Active Directory database. 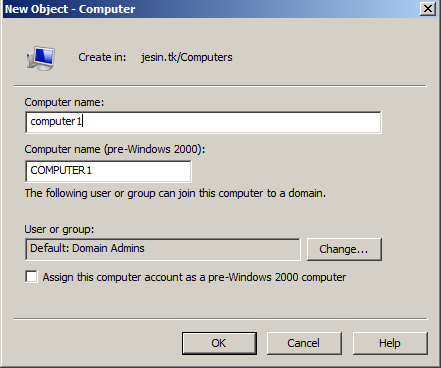 Prestaging means to add a computer to the Active Directory database before joining the computer to the domain. By prestaging a computer you can make sure the WDS (Windows Deployment Services) server responds only to known computers. By default if you join a computer to a domain the computer object is created in the Computers container, even though you can move it to another container later, by prestaging you can place the computer inside the container of your choice even before joining it to the domain. If your domain controller is also a WDS server you’ll have the option of entering the GUID of the computer while creating a computer object, but otherwise there is no “direct” option to enter the GUID. Entering the GUID is done differently on windows server 2003 and 2008 so the first step is to create a computer object which is same on all Windows Server editions. Go to Start – > Control Panel -> Administrative Tools -> Active Directory Users and Computers or Start -> Run and type dsa.msc. Right-click the container inside which you wish to place the computer, navigate to new -> computer. This needn’t necessarily be the computers container it can be any OU. Enter the netBIOS name of the computer you wish to prestage. This is the computer name which is displayed under the “Computer Name” tab of the system properties. The next step is to enter the GUID of the computer. This is where steps differ between Windows 2003 and 2008. Our aim is to modify an attribute named netbootGUID of the computer object and enter the GUID of that computer. For this purpose you’ll have to install the ADSI editor. After installation go to Run and type adsiedit.msc. Navigate to Domain[domaincontroller.domain.tld] -> DC=domain,DC=tld -> Container-or-OU-Name. The computer is shown as CN=ComputerName. Right click it and go to the properties. 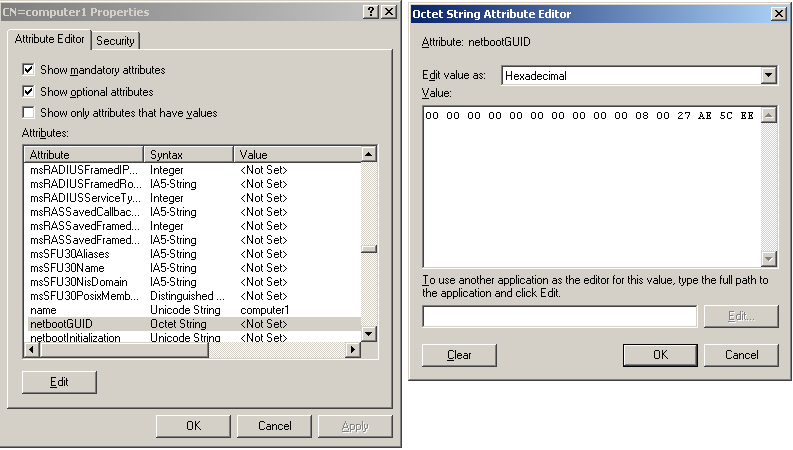 It much much easier to edit the netbootGUID attribute in Windows 2008 because it has an in built attribute editor. Go to Start – > Control Panel -> Administrative Tools -> Active Directory Users and Computers or Start -> Run and type dsa.msc. 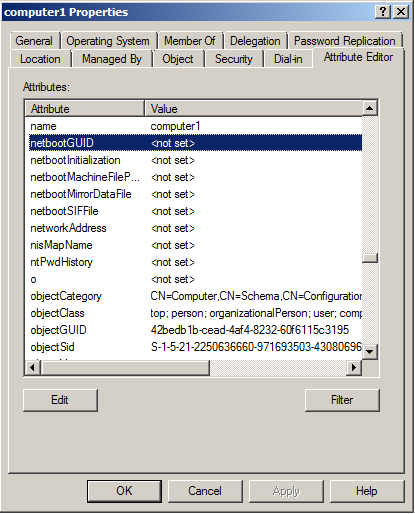 Go to the View menu -> Advanced Features, open the properties of the computer object, go to the attribute editor tab and edit the netbootGUID attribute. This totals to 32 characters, save the attribute and its done, you’ve successfully prestaged a computer in Windows Server 2008.